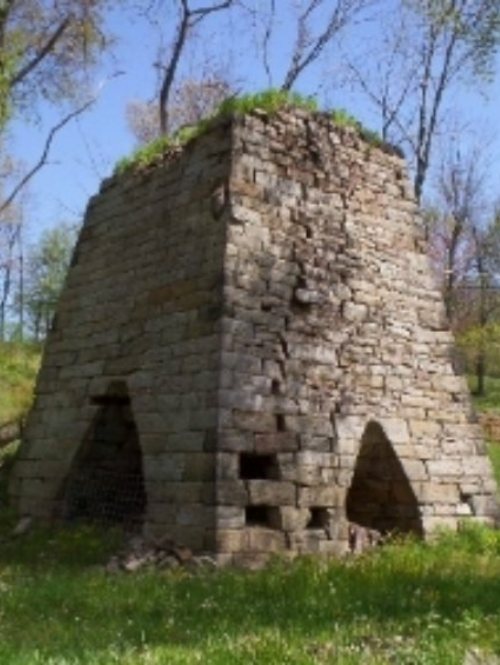 The Mount Vernon Furnace was one of five Iron Furnaces constructed and owned by Isaac Meason. The success of the furnace depended upon four natural resources: Iron Ore, Limestone, Timber, and Water. Along the base of Chestnut Ridge was an excellent quality of Ore and Limestone, a vast abundance of Woodlands, and Mounts Creek. The furnace had their own mills to cut the lumber and mills to grind the feed for the animals. The trees were cut by hand by the woodsman and work horses were used to drag the trees from the woods to the mill. The trees were then cut into smaller pieces and charcoal was made to feed the furnace fires. The timber lands were cut over every 25 years. Mount Vernon had cut their second growth of timber from its lands before blowing out in 1830. The metal was cast into Kettles, Utensils, Iron Bars, and other moulded products and then carried to Connellsville for shipment "Down River" and further "West". Some shipments going as far as Louisiana.